Sometime two years ago when Eric Stenclik was teaching Spanish at Canisius College and trying to finish his 300-page dissertation about the poet Hart Crane, he searched online and typed in the words "personal chef" and "Buffalo." He found "www.dinnerbygretchen.com," and a way to save 15 or 20 hours a week. "Within 10 minutes of Gretchen's arrival, aromas flood the house and it's beautiful," said Stenclik as he opened his front door on Oakland Place. The hallway smelled of garlic. 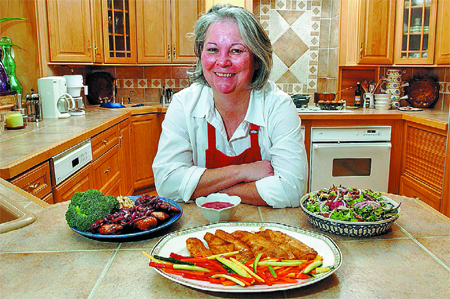 In the kitchen, Gretchen Ohar, a registered nurse turned entrepreneur, stood over a pan of chicken simmering in a raspberry balsamic sauce. She was part-way through making four entrees and side dishes that would add up to 16 meals and a few weeks' worth of eating that cost Stenclik $70 for the groceries and $255 for the prep. "It's like having a restaurant in your house but more reasonable," said Stenclik, calculating the economies of saving on dinners out with drinks and tips. Ohar, whose business has been gradually growing in the last five years, is among a series of new local ventures making money by doing other people's errands. Beyond household cleaning services -- of which the telephone book lists 22 in Erie County -- dog walkers, personal chefs, a home-delivery dry cleaner and a three-month-old personal "concierge" service are finding clients who feel too maxed out to drop off dirty clothes, pick up the new Harry Potter video when it comes out Monday, walk the dog and make dinner. The International Concierge and Errand Association confirms the errand trade has been growing. The organization, which started in 2000 with two members, now has about 375. Another 50 members are in far-flung cities from Toronto to London to Beijing. "It's nice to know they can pick up the phone quickly and I will get back with them directly," said Dru Jensen-Jones, president of the association and her own Jacksonville, Fla.-based Concierge Concepts International. She and her staff of five have posts in luxury apartment buildings and do errands for anyone who is willing to pay $75 to $95 an hour. Jensen-Jones' recent requests include people coming to their Florida home and wanting flowers and a dinner party arranged for the day after they arrived. One man wanted four tickets to a sold-out Bonnie Raitt concert for an extra $25-a-ticket concierge fee. Another client called on a Monday afternoon wanting an over-the-top celebration for his wife's 40th birthday on Thursday. Jensen-Jones arranged champagne waiting in a rented Rolls Royce, a shopping spree stop, a private lobster meal with a piano accompaniment at a country club. The evening's tab: $4,800. "She wrote me a letter and said it was the most unforgettable meal she had ever had," said Jensen-Jones of the wife. For the time being, the Williamsville-based "Concierge of Buffalo" is newer and more low key. Owner Anthony di Pota charges $30 an hour and has about 10 regular clients who've called on him to shop for milk and eggs, Christmas iPods, and rose and tulip bouquets for Valentine's Day. One man just had di Pota research and book a summer trip to Paris when he plans to propose to his girlfriend. "He's pretty much hoping she won't say no at 30,000 feet," said di Pota, who charged $195 for the project that took about six hours. He got the idea for his business from a TV show about the emerging trade. He borrowed money to start up after he got laid off from his job selling cars in October. One client, a personal trainer and eBay trading card purveyor, heard about di Pota when telling a gym client how there was no way he'd get packages in time to meet the customer deadline. "I called him that night," said Gary Croft, of Tonawanda, who shares one car with his wife. "He came by Saturday morning when I was stranded at home." Another time in Clarence, Croft locked his keys in the car. DiPota, who charges 15 percent extra for trips not booked a day in advance, drove to pick up a spare set from Croft's wife and delivered them to a grateful Croft. "It's kind of like having a friend except he's well dressed, reliable and professional," he said. For Michele Miller, a single mother and assistant to a lawyer, di Pota's fees are worth it because they free her to spend more time with her 7-year-old daughter. He picks up and delivers her dry cleaning. Once when she needed a deli platter for an office luncheon, diPota came through within hours of being called. Lately, Miller has been thinking she'd like to have him take her car in for repair. It seems to her that as a woman she gets charged for things she doesn't really need. Miller suspects DiPota might get a fairer price because he is male. And, she won't have to bother with dropping off the car herself. "I'd rather spend time with my little one than do stuff that I hate," Miller said. "It's paying for a husband without doing his laundry." In the past four years the Elmwood Village-based Urban Valet Dry Cleaners has made a specialty of picking up clothes, and even shoes in need of repair or shine, in bags with special bar code tags. Some 1,000 clients from Clarence to Buffalo to East Aurora have eliminated dry cleaning errands by signing up for the free service. Mary Ellen Hager, of Derby, gets clothes picked up on Tuesday and dropped off on Friday. The prices seem slightly higher than some places, but she said the expense is worth it. As she lives away from the city, she is spared three or four hours of driving around each week. "It just makes day-to-day life so much easier," said Hager. The Hamburg-based Sit n' Stay pet services says its business has developed in the past four years with some 29 regular dog walking clients as more and more people are willing to pay $15 for a half hour walk or $30 for an hour. Russell Arnst, the owner of the elderly border collie Babe, said he hired the service about four years ago after his job as a senior financial adviser got busier. It relaxes him to know that his dog is being looked after with an afternoon walk and a feeding. "I needed a break from having to rush home everyday after work," Arnst said. Now it is his apartment that has been bugging him because he doesn't have time to keep it as clean as he would like. He's had trouble finding a good reference for a house cleaner. "If I could get Sit n' Stay to do all of the above, I would love life," Arnst said with a laugh. For the last five years that Gretchen Ohar has been working as a personal chef, she's found her six regular clients fall into three categories: Working parents with children, senior citizens who can't cook as much as they used to and professional childless couples who want to come home and unwind together without rushing. To make things easy Ohar corresponds about menus by e-mail and shops for extra things if clients ask. As she worked in Stenclik's kitchen, four servings of cheese enchiladas and rice were in aluminum tins, ready to be frozen. Ohar, who created the job for herself so she could care for her mother at home with Alzheimer's, figures her business has been growing because people are busy with work, but want to lose weight and eat well without resorting to fast food dinners of hamburgers and pizza. Stenclik suspects that people feel more drained at the end of the day because e-mail and cell phone access have people doing more in the same span of hours. That exhaustion leaves people with less energy to cook. "I think people can take on a lot more at work than they used to," he said. After a few years of meals made by Ohar, Stenclik's dissertation at 250 pages is nearly finished. When he's finally done, Stenclik has no intention of giving up his personal chef. "I'm saving more time. Overall, I think it's healthier," he said. "It makes the evenings much more pleasant."